Drawing deeply from Aristotle and biblical teaching, Politica presents a unique vision of the commonwealth as a harmonious ordering of natural associations. According to Althusius, the purpose of the state is to protect and encourage social life. The family is the most natural of human associations, and all other unions derive from it. Power and authority properly grow from more local to more general associations. 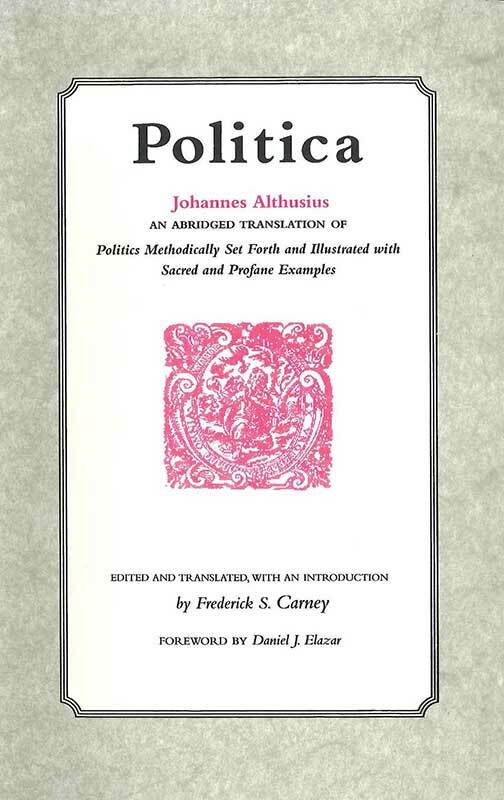 Johannes Althusius (1557–1638) was a German political and legal philosopher. Frederick S. Carney was Professor Emeritus of Ethics at the Perkins School of Theology, Southern Methodist University. Daniel J. Elazar was Director of the Center for the Study of Federalism at Temple University and Professor of Political Science at Temple and at Bar Ilan University in Israel. Translator's introduction, foreword, Althusius's outline of the book, note on the Liberty Fund edition, bibliography, index.